The much rumored Microsoft’s attempt to take a slice from Apple’s remarkable iPod success has now been confirmed by Microsoft officials and it has a name Zune. Perhaps the alliance Microsoft formed with several makers of portable music player that works around its Windows Media Player has proved to be not as charming as compared to the Apple iPod + iTunes combination. 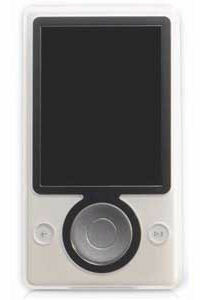 Perhaps the “killer” feature in Zune that could differentiate itself from the iPod and all the other competitors would be the integration of WiFi connectivity on the portable music player. Having WiFi connectivity simplifies the data transfer of files (songs) to the portable music player without the hassle of plugging the cables. But is WiFi connectivity the answer that could make a dent on iPod’s dominance? Only time will tell. On another note, it’s the charm of Steve Job’s great marketing campaign, as well as the esthetics, elegance, simplicity and user-friendliness of the iPod + iTunes that made it such a successful phenomenon despite not having any technological breakthrough in terms of features compared to any other portable music players in the market. Could Zune be just as charming? From the leaked photos of the Zune, it looks like Zune might just be as attractive (in my opinion) in terms of its physical design. It seems to have borrowed the “wheel” from iPod’s design with some significant changes (of cause), and combined it with a big screen that would also resemble a PDA. Perhaps deep beneath Zune is an OS powered by Microsoft’s Windows Mobile. It would certainly be interesting to see the two old enemies, Microsoft and Apple battle for a slice of the lucrative portable music player market. In the midst of the battle, many existing players such as Creative, iRiver, Samsung, Sony and the likes may be affected. Having an array of great features on the Zune is most welcomed, but having a great user interface (experience) that could tap into the array of features is even better. Hopefully Microsoft could pull off the Zune and be the rumoured “iPod-killer”. Otherwise, it may end up being yet-another-iPod-derivative. Perhaps I should put off my plans to get a new mp3 player and wait for the Zune to be released by end of this year before deciding on an mp3 player. I think its great Microsoft has jumped into the market against iPod. I hope they make a great player and we see some competition in the market.